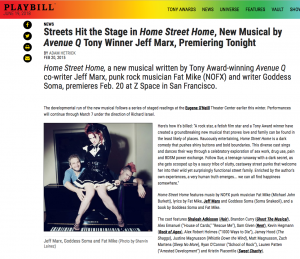 Home Street Home, a new musical written by Tony Award-winning Avenue Qco-writer Jeff Marx, punk rock musician Fat Mike (NOFX) and writer Goddess Soma, premieres Feb. 20 at Z Space in San Francisco. The developmental run of the new musical follows a series of staged readings at the Eugene O’Neill Theater Center earlier this winter. Performances will continue through March 7 under the direction of Richard Israel.